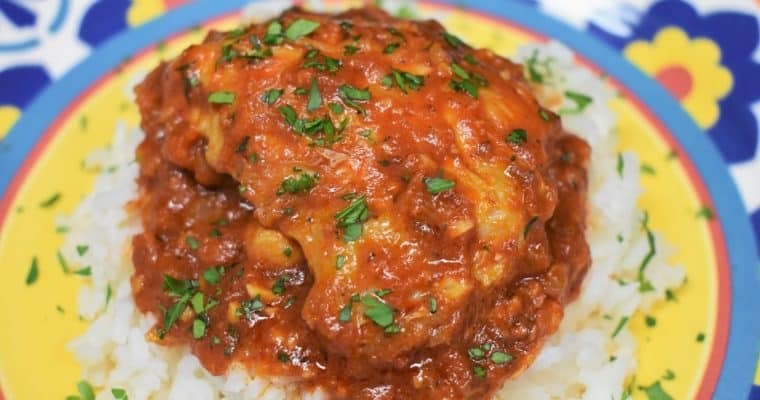 If you need more family-friendly recipes that will feed a crowd, try this Turkey-roni, which is a modern take on a childhood favorite, these shredded chicken enchiladas, or this Italian sausage baked ziti. Enjoy! In a small bowl combine the chili powder, garlic powder, 1 tsp. salt, cumin, black pepper and crushed red pepper, if using. Stir well to combine, set aside. Heat the canola oil in a large, deep skillet over medium-high heat; add the ground turkey, and the prepared spices. Stir the turkey and spices well to combine. Cook the turkey until browned, approximately 5 minutes. Stir with a wooden spoon or spatula and break up the ground turkey as you go. Add the chopped tomatoes, chicken broth, black beans and corn to the skillet. Stir to combine all the ingredients well. When the sauce comes to a full boil, lower the heat to medium-low, cover and simmer for at about 20-25 minutes, stirring occasionally. If the liquid is boiling vigorously, lower the heat just a little; keep the sauce at a simmer. While the sauce cooks, start the pasta and preheat the oven to 350°F. Bring a large pot of water to a boil. Cook the rigatoni pasta according to package directions for al dente. Remember to salt the pasta water. Drain the pasta well and set aside. When both the pasta and southwestern sauce are done, add the pasta back to the large pot, add the southwestern sauce and stir well to combine. Add half of the pasta to the casserole dish, sprinkle with half the cheese. Add the remaining pasta and top with the remaining cheese. Bake the southwestern pasta for 10 minutes or so, until the cheese is melted. Place the casserole dish on a large baking sheet just in case it bubbles over, it will also be easier to remove from the oven. Serve the southwestern pasta with hot sauce, if desired. 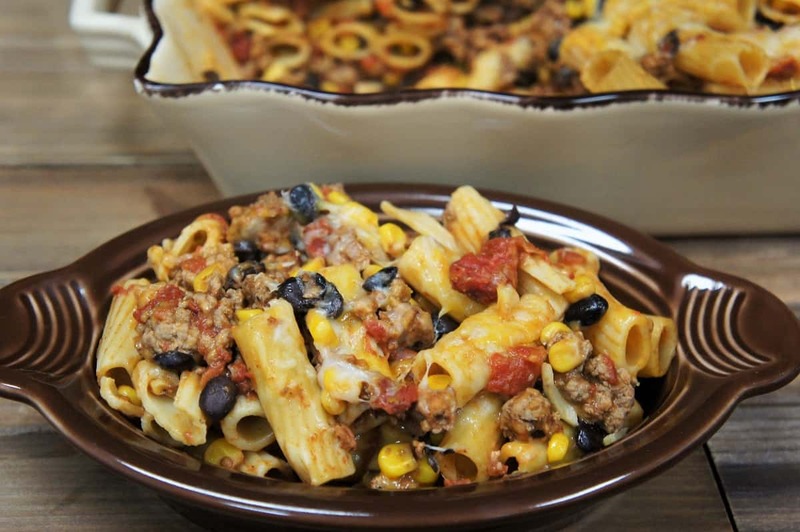 If you’re looking for a quick, satisfying meal that will feed a crowd, try this southwestern pasta. 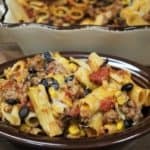 Rigatoni pasta is combined with ground turkey that’s been seasoned with southwestern-inspired spices and simmered with tomatoes, black beans and corn. In a small bowl combine the chili powder, garlic powder, 1 tsp. salt, cumin, black pepper and crushed red pepper, if using. Stir well to combine. Heat the canola oil in a large, deep skillet over medium-high heat; add the ground turkey, and the prepared spices. Stir the turkey and spices well to combine. Cook the turkey 5 minutes until browned. Stir with a wooden spoon or spatula and break up the ground turkey as you go. Add the chopped tomatoes, chicken broth, black beans and corn to the skillet. Stir to combine. Bring the sauce to a full boil, lower the heat to medium-low, cover and simmer for at about 20-25 minutes, stirring occasionally. Bring a large pot of water to a boil. Cook the rigatoni pasta according to package directions for al dente and drain. 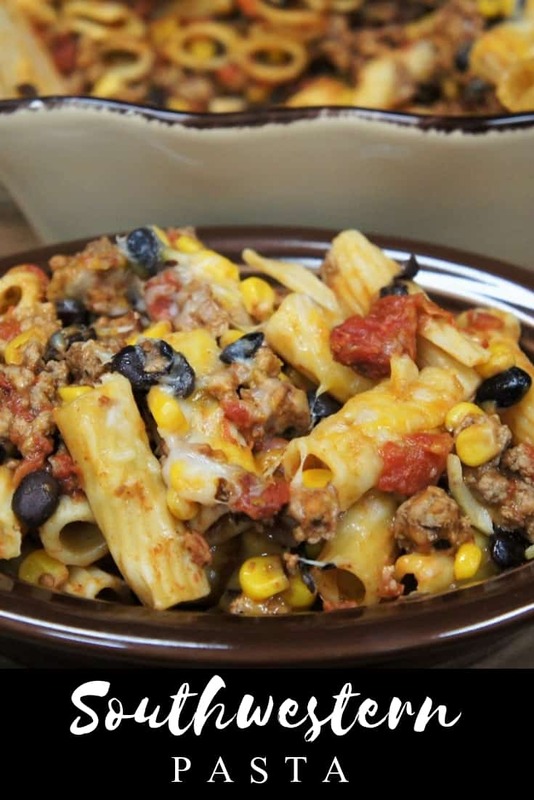 When both the pasta and southwestern sauce are done, add the pasta back to the large pot, add the southwestern sauce and stir well to combine. Add half of the pasta to a large casserole dish, sprinkle with half the cheese. Add the remaining pasta and top with the remaining cheese. Hi! I think pureeing the tomatoes will work. They make up part of the sauce so getting rid of the chunks should be OK. 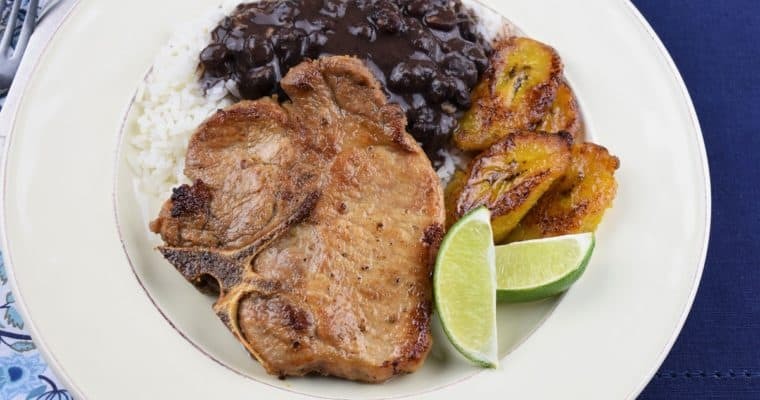 I hesitate to recommend a substitution since I don’t know how a prepared sauce would combine with the spices in the recipe. Good luck and let me know if you give a try!